Gathering the diverse groups in our beloved community to celebrate Martin Luther King, Jr. Day in the spirit of sisterhood and brotherhood with fellowship and fitness. Starting and finishing in the Birmingham Parkside District, race participants come from diverse populations that include all demographics, races, cultures, genders and creed to celebrate the meaning of the holiday in a fun and fitness way. The race features drumlines from the metro area schools that will line up along the race course to keep the beat as the runners and walkers make their way. 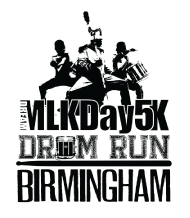 The race day activities includes a warm up, live music, professional timing, sponsor booths, post party and the race goodie bags with the popular MLK DAY 5K Drum Run shirt for all race entrants. If you are a nonprofit, church group, school org, foundation or community group please register as a team and receive $5.00 back for every registered team member for your organization's community efforts. The race website www.mlkday5kbham.com is available for registration, volunteer sign up and sponsorship. For more information please contact Herman Mannings III at 404-545-3732 or via email info@leftoverenergy.com. 12th Street S. and 1st Ave S.